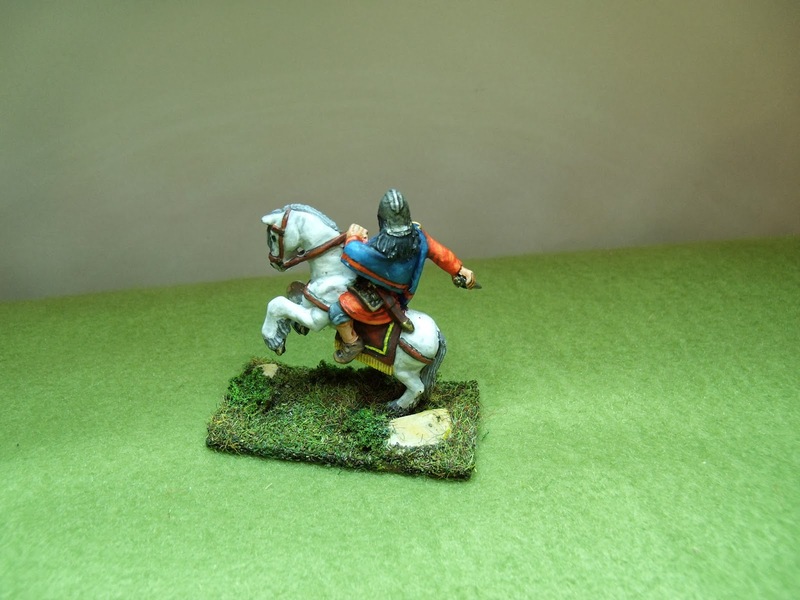 This guy is my take on Lancelot. And as he rode his armour rung, Beside remote Shalott. 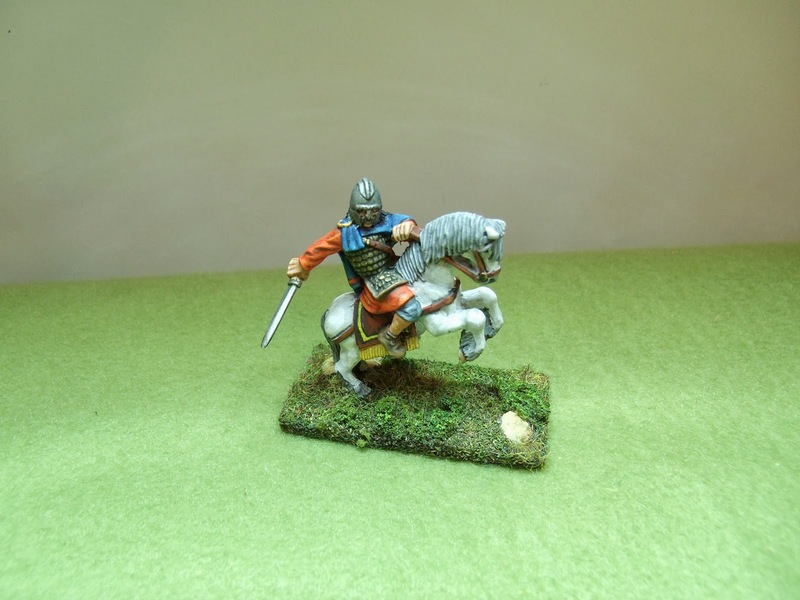 He's a Gripping Beast mini, sold as a Strathcylde noble for Saga. The style of the helmet, his scale armour, short trousers and lack of stirrups make him totally suitable for Sub-Roman use too. 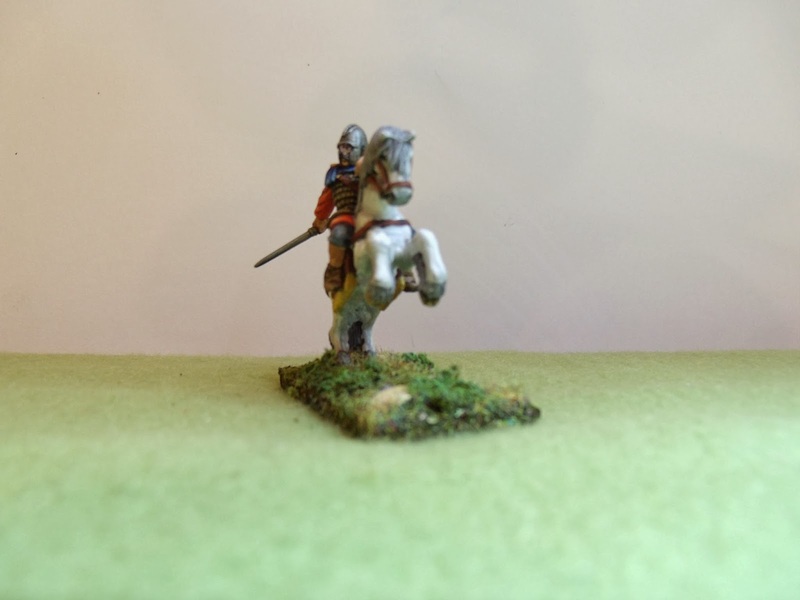 The Dux Brit reinforcements for the British grant an additional Class II noble to go with the shock cavalry, so this chap will be using his activations there, as well as (eventually) leading my Strathclyde Saga force. He is provided as a two-piece casting: horse and rider as one piece, and a separate sword. This would allow some option for variation should you want it, replacing sword with spear, for example. I built him up "as is". Some bits of the horse needed some fairly brutal (Dremel) cleanup, but the rider had minimal joint lines, and there was no flash anywhere. Note he doesn't come with a shield. I did quite a bit of head-scratching about this. I went through the time-honoured ritual of thinking thrice and measuring twice before getting to the point of cutting once, but even thinking and measuring a lot more times I couldn't come up with a totally convincing solution. There simply isn't room for any "normal" sort of Sub-Roman shield, whether round or oval, never mind the table-top sized ones the rest of the shock cavalry are carrying. The only way to give him a shield is to go to the data in Heinrich Harte and Tania Dickinson's work, and make him a bucker, in the Saxon style. Harte and Dickinson give the smallest archaeologically attested bucker diameter as 34cm (6mm in scale). The space available allows you to go slightly away from the bleeding edge, to something like 8mm (45cm in full size). I made up some plastic card bucklers that size, and dry fitted them. They just didn't look right. So, I went with the figure as it is. Lancelot is quick and agile enough, fighting on his own, to avoid getting hit. 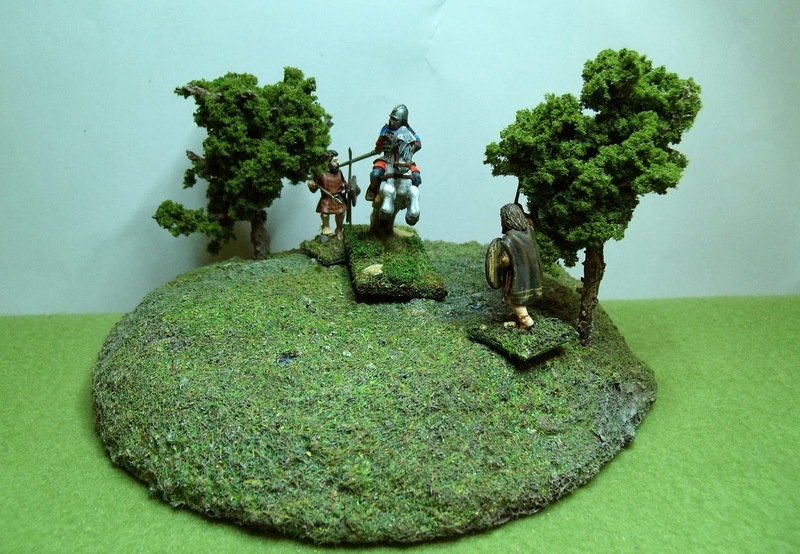 These two Pictish skirmishers might just about live to regret trying to ambush Lancelot as he rode through the trees.